Scoliosis is a curvature in the spine, normally straight, which could appear as an “S” or a “?”. Orthopaedic Associates of St. Augustine is proud to have Dr. Brian Haycook, a fellowship trained spine surgeon on our team who has training in treating scoliosis. Scoliosis is usually mild, but in some cases can cause spine deformities in children or severe pain and discomfort. Idiopathic scoliosis (the most common form) is found mostly in children ages 10-16. It often becomes apparent during adolescent growth spurts. Girls are more often affected by scoliosis. In mild cases, scoliosis may not show any symptoms. However, symptoms may arise if the case is more severe. Idiopathic: This is the most common type of scoliosis. There is no identifiable cause. There is, however, evidence that it may be an inherited trait. Congenital: This type of scoliosis is caused by a bone abnormality that you would’ve had since birth. Degenerative: This is the result of a traumatic injury or illness that led to a weakening of the bones (e.g., osteoporosis or major back surgery). Neuromuscular: This type is most commonly found in people that already have another condition which causes abnormal muscles or nerves (e.g., spina bifida or cerebral palsy). 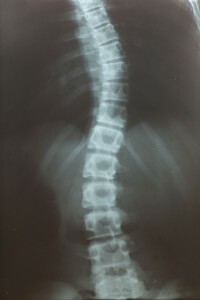 While visual clues will usually lead a doctor to the theory that a patient has scoliosis, an X-ray is used to confirm that the spine is curved past a certain degree. Depending on the severity of scoliosis, treatment may be unnecessary. If the doctor decides intervention is needed, they will typically use a brace if the patient is still growing and the curve is between 25 and 40 degrees. This should stop the spine from curving further. If the curve is greater than 40 degrees or present in a patient with a preexisting condition such as spina bifida, surgery may be considered as the best option. It is rarely possible to create a perfectly straight spine through surgery, though it does normally make a sizeable difference in the degree of curvature. If you think you or your child may have scoliosis, please request an appointment online or call at 904-825-0540.